Dubai: The first phase of La Mer — set within one of Meraas’ string of new beachside destinations for Dubai — will open on October 15. Stretching right out into the ocean at Jumeirah 1, La Mer will span 13.4 million square feet of existing and reclaimed land located between Pearl Jumeirah and Jumeirah Bay. It will be home to multiple F&B and niche retail operators. The La Mer design does not use any of the tried-and-tested formula the city has seen. Instead, it is built integrating the water and sand elements. It is inspired from the “way the sea embraces driftwood, timber, rusted metal, barrels and other items, brought by the tide to shore,” the developer says in a statement. And many of these form the “main elements” of the built-up environment. This theme is visible through the architecture and public spaces. Day rooms and cabanas will allow visitors to have prime beachside access “from dawn until dusk”. It will also have the “Hawa Hawa”, an air-filled trampoline popularised in Japan. Surrounded by almost 2.5 kilometres of beaches, the shopping, dining and entertainment areas at La Mer will open to the public in two phases. The first comprises La Mer North and La Mer South, which has over 130 hundred shops, cafés, restaurants, and beach activities. The second phase of La Mer, The Wharf, incorporates rusty steelworks and an industrial aesthetics, with a watermark featuring a surf park. These are scheduled to open at the start of 2018. At a later stage, there will also be a hotel and residential community located on two man-made peninsulas. 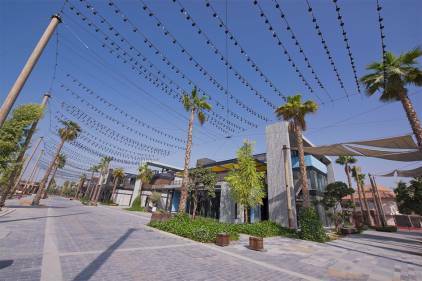 La Mer is the seventh destination delivered by Meraas in the past three years, following City Walk, The Beach, Boxpark, Last Exit, The Outlet Village and Al Seef.